Replacement flat section neoprene rubber drive belts available in popular sizes to fit many hi-fi turntables and other diverse units; eg Revox A77, B77 & PR99 Mk1, tape recorders, cassette decks, turntables, walkman, CD / DVD / XBox door tray drives, VCRs, projectors, tools, models and toys. Price: All belts are Â£8.50 + 1.50 (UK p&p) = Â£10 (except specials). Click on to pay by card or PayPal. Or download our Order Form or order by phone; 0131 661 0022. Contact us for EU and International export prices. 1. 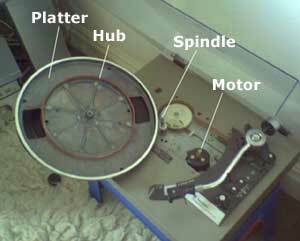 Remove the rubber mat and lift off the platter (most hubs just lift off, some require the removal of a circlip at the spindle). 2. Turn the platter over and measure the circumference of the hub (red line in the photo). The belt needs to be tight enough to hold on the inner hub with minimal stretching so deduct 5 - 10mm from the circumference to calculate the right length. The motor pulley offset should not be added to the equation as this stretch provides the correct drive tension for the belt. 3. Fit the belt on the hub and replace the hub on the spindle. 4. Rotate the hub until one of the inspection holes is above the motor pulley. Grasp the belt and hook it over the pulley and through the speed changer mechanism (this stretch gives the belt the correct drive tension). 5. Check that the deck runs with no fouling, replace the mat and you're ready. 1. 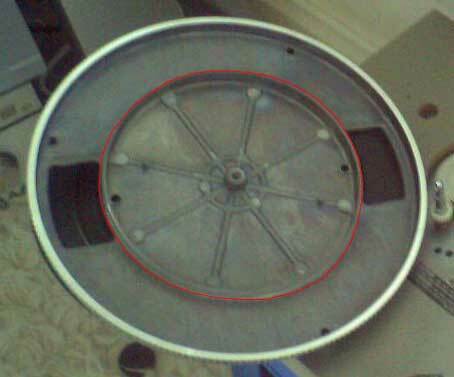 Remove the rubber/felt mat and lift off only the outer ring section of the platter. 2. Use a piece of string to measure the total distance round the hub and motor. Then deduct 3 to 5% (typically 18-30mm) to give the correct drive tension. 3. Fit the belt on the hub and place the outer platter upside down on the hub to check that the belt runs with no fouling. 4. Then turn the platter the right way up, replace the mat and you're ready. 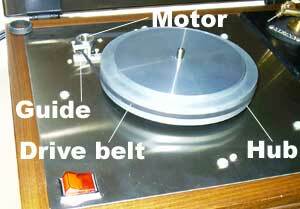 Use a piece of string or wire to measure the total distance round the band drive path. Then deduct approximately 10 to allow the correct drive tension. This is the least accurate way to replace your belt and is not recommended. When measuring an old belt, remember it has certainly stretched with age like a rubber band, so you will need to replace it with a slightly smaller one. The problem is that there is no way of knowing how much it has stretched. If you are unable to measure your hub (red line in the photo) circumference, measure the diameter and use the table above, which uses the equation: C (circumference) = Pi x D (diameter). All measurements shown are approximate given the elastic nature of neoprene rubber drive belts, measured internal, flat and non-stretched. other drive belts: round section, square section. 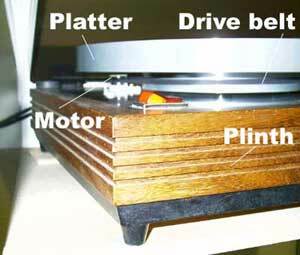 USB converters to digitise your vinyl or tapes via your PC or laptop. BELT04 is known to fit: Aiwa PXE770, PX-E800, Fisher MT75, Luxman PD300, Philips, Pioneer C6000, PL50A, Sonab 75S, 85S, Yamaha CS50P. (March 2018) This belt is now discontinued and our supplier has no more stock. We have a small quantity in stock until sold out. "Hi, I've received it and it's the correct one as well. I'm absolutely made up. Thank you so much for your help and patience - if it wasn't for your instructions and your wide range of drive belts I would never have been able to resurrect my record player. Thanks very much again,"
"Hello... I would like to say thank you for helping me get the right belt for my turntable and the stylus as well. "After much searching, I would like to thank you for your help and promptness in getting me a drive belt for my 80s Sharp stereo. I ordered it 13:30 on Friday and received it the next day Saturday! If only everyone could be that efficient! The belt fits great and my Sharp stereo works like a dream after many years. "Many thanks for the T38 drive belt. All working perfectly. Great service from your company" Kind regards. 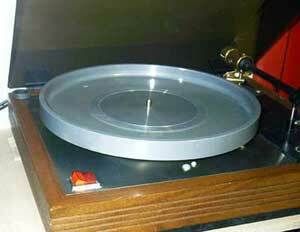 "I initially found your website via Google search, probably using the string "turntable belt replacement". There were a few options, but your site is the most informative and reassuring of correct ordering. Regards, Steve" (2004). We have neoprene, rubber drive belts to fit most models of turntable, CD, DVD, VCR, cassette, walkman, open reel, tape, 8 track, video, projector, manufactured by AR, Acoustic Research, Aiwa, Akai, Alba, Alesis, Alphason, Ampex, Ampro, Amstrad, Arcam, Ariston, A-T, Atari, Aurex, Audio-Technica, Audiophile Concept, Audiotronic, Autovox, B&O, Bang and Olufsen, Bauer, Bel-Air, Beocord, Beogram, Binatone, Blaupunkt, Brother, BSR, BT, Bush, CEC, Citronic, CJ Walker, Clarion, Cloud, Connoiseur, Continuo, Cossor, Cranfield, Crown, Currys, Daewoo, Decca, Decimo, Denon, Diango, Discomaster, Discomatic, Dual, Dunlop, Dynatron, Eagle, Echo, Eclipse, ELF, Elite, Elizabethan, EMI, ERA, Ferguson, Ferrograph, Fisher, Fisher-Price, Fons, Ford, Fostex, Garrard, GEC, Gemini, Genexxa, Goldring, Goldstar, Grundig, Harman, Harman Kardon, Harry Moss, Heybrook, Hitachi, Imation, Ion, i-Symphony, ITT, Javelin, Jones, Jukebox, JVC, Kaleidoscope, KB, Kenwood, Kerzo, Kuzma, Lanier, Leak, Legend, Leica, Leitz, Lenco, LG, Limit, Linasound, Linn, Logic, Luxman, Mantra, Manticore, Marantz, Marconiphone, Matsui, Matsushita, Maytion, Micro-Seiki, Micromega, Minerva, Ministry of Sound, Mission, Mitsubishi, MOS, Motorola, Murphy, NAD, National, Neal, Network, Nikko, NJD, Numark, Onkyo, Optimus, Optonica, Origin, Otari, Panasonic, Pencrest, Philips, Pink Triangle, Pioneer, Plessey, Premier, Prinzsound, Project, Proline, PT, Pye, QED, Radiomobile, Radionette, Rank Domus, RCA, Real Sound, Real Sound Co, Realistic, Rega, Revolver, Revox, Roberts, Roksan, Roland, Rollei, Rotel, Saba, Samsung, Sansui, Sankyo, Sanyo, Schneider, Scott, Sharp, Sherwood, Silver, Simms-Watt, Sinclair, Soundlab, Source, Sonab, Sony, Sovereign, STD, Steepletone, Stelaphone, Stanton, Striker, Sunday Times, Synchro, Systemdeck, Tamashi, Tandberg, Tandy, Tascam, Teac, TEC, Technics, Technosonic, Telefunken, Teleton, Tensai, Tevion, Thomson, Thorens, Thorn, Toshiba, Townsend, Tricity, Trio, Triumph, Tutelary, Umica, Voightlander, Wien, Vega, Veho, Volvo, Voyd, VPI, Vyger, Yamaha, Zennox.